which contains an absolutely amazing range of landscapes, climate zones, and minority cultures and histories. 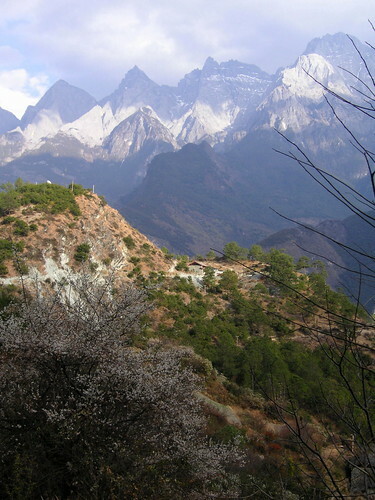 introductory shot captures much of the essence of our hike: the flowering plum and beautiful hillsides, with the massive and magnetic bulk of Jade Dragon Snow Mountain (that’s its English translation) in the background. track: in the next few shots, one in particular is not sorted quite as I could wish. The shot looks down on the river from up above, and you see a few little boats pulled to the shore. This is, in fact, the ferry with which we crossed the river at the beginning of our visit to the gorge itself. (See later for the full story.) Also, pause a moment at the shot that looks down a vertiginous gully at the river itself, being joined by a small side stream that’s coming from high up on the north-west slope of the gorge. It’s disorienting since the drop is so sheer and far, but if you study it for a moment you’ll get more of a sense of how amazing this canyon is. All three of us, passionate visitors to the Grand Canyon, found this area equally beautiful, though not as vast.